Personal Trainers › Find personal trainers in your area. 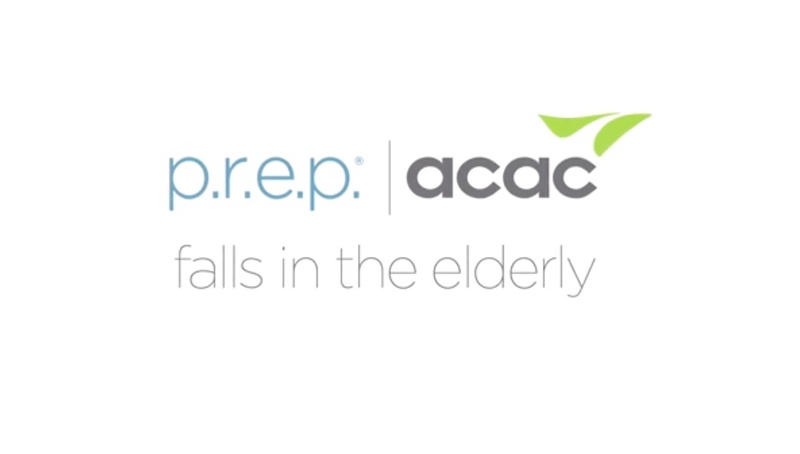 Learn about fall prevention and critical preventative measures that you can take to protect yourself, and how to exercise to build strength vital for gait stability, core, hip, and leg strength. Hi, I’m doctor Gregory Degnan, the medical director for ACAC, and a practicing orthopedic surgeon. In today’s video we will be discussing falls in the elderly. When we look at the scope of this problem, and the people who are most likely to be involved, it’s important to understand that the single most significant risk factor is being over the age of 65. One in three adults over the age of 65 will sustain at least a ground-level fall, among adults over 65, falls are the leading cause of both fatal and nonfatal injuries. Over two million non-fatal fall injuries among older adults are treated in emergency rooms, and over 650,000 people are hospitalized each year related to falls in the elderly. When we look at the actual injuries sustained and the potential outcomes in these injuries, it’s important to understand the falls are the most common cause traumatic brain injuries. The vast majority of fractures in older adult population are the result the falls, and a large number of older adults who fall, even when they’re not injured, do develop a fear of falling. Often this will lead to a limitation of their activity, reduced mobility, and de-conditioning, and ironically, this actually increases their risk of falling and also increases their risk of severe injury from those falls. When we look at why people in this age group tend to fall, we really are looking at two factors; there the actual physical changes that are related to the aging process, and there are the physical factors related to, generally, the layout serve our homes. Physically, visual impairment, as we age, is a significant contributor to falls both in terms of its impact on our ability to get the visual input for balance and also on our ability to see those things which might cause us to trip and fall. Loss of strength, that is associated with aging, is another significant factor. There are other changes in our nervous system, and in our inner ear, that also contribute to loss of balance and our ability to handle uneven terrain. The loss of flexibility that we develop with aging impairs our ability to handle uneven terrain and falls, and also impacts our ability to handle the actual impact of the fall, thus resulting in more severe injuries. When we look at the physical layouts of our homes, which contribute to the risk fall, taken room by room, if we look at our house layout, looking in the kitchen, which is a significant area for falls, and also one of the rooms in which we see the most severe injuries associated with fall, the layout is usually related to how we utilize our storage spaces. Ensuring that things that we use commonly don’t require us to reach up overhead or go up onto a step stool as a prevention strategy. When required to use a step stool it’s important remember not to use chairs, and to use rubber-shod step stools to ensure no slippage. Hallways should be well lit, with night lights, and stairwells should have light switches at both the top and bottom up the stairwell, and you should ensure that hand rails are well affixed and present on both sides and the stairway. In the bedroom it’s important to ensure that the night light that you have next year bed is easily reachable, and you should ensure that the pathway between the bed and the bathroom is unobstructed and well-lit. Floor furniture accessories such as magazine racks and potted plants are a common potential source for tripping and falling. Maintain a clear pathway through high traffic areas by eliminating any floor level furniture accessories. A regular exercise program is actually a critical component when we look at both the prevention of falls and also minimizing the severity of injuries which may be sustained from a ground-level fall. The American College of Sports Medicine has a position paper, position statements, which specifically outlines guidelines for the use exercise and the elderly population. Resistance training to increase strength will help prevent the ground level fall that so commonly occurs, and also as more muscle mass is maintained, diminishes the impact of that fall and lessens the severity of the resulting injury. A flexibility component to your exercise program, again, improves your balance and minimizes the potential for fall, but also by lessening the rigidity of the body at the time of impact, diminishes the potential for severe injury which can result from that fall. The sad fact is that falls to occur frequently, and the severe injuries that frequently result can significantly impact the quality of life, not only for the patient who falls, but also the family and friends who must care for them and deal with the aftermath. Additionally, the truth is that these false and the subsequent injuries can not only diminish the quality of life but also lead to accelerated demise. In reality, a common sense approach to how we organize our lives and our living spaces, and a good regular exercise program that includes some aerobic conditioning, resistance training, and a flexibility program can significantly diminish the risk of those falls and also significantly diminish the potential severity of the injuries which may result. Why is your risk of falling, and fall related injuries, greater as you age? While aging is a natural process, the steps you can take to help avoid or prevent falling as you get older are simple to implement. You risk for fall increases as you get older because of many factors. One factor, in fact, the greatest risk factor for falling, is your age. If you are over the age of 65, your risk for experiencing a fall is 33%. Okay, but, why do one-third of Americans over the age of 65 fall? As you age your senses, physical strength and stability, physical ability and confidence related to walking, climbing, and stepping up-and-over structures, including stairs, becomes impaired. These impairments occur largely because of muscle atrophy and loss in muscle strength. The loss of muscular strength results in instability of large joints including your hips, knees, and ankles. When you lose strength and stability, activities of daily living, and physical activity, become much harder to perform, therefor when you do perform tasks as I’ve mentioned above your risk for falling and tripping is much higher. In addition to muscular atrophy, or muscle weakness, other physical factors contribute to greater risks for falling. These factors include vision impairment, reduced proprioception, or awareness of your limbs in relation to the mid-line of your body, slowed physical reflex, and decline in mental acuity. Illness and disorders can play a role in your increased risks for falling as well. Hypotension, physical impairment related to diabetes and foot injury, dehydration, and many medications, as a result of side-effects, can contribute to additional risk factors for falling. When considering these, and other, risk factors for falling it is important to consider all biological, genetic, or medical influences, psycological or mental state, and social or environmental factors together to develop a comprehensive fall prevention strategy. It is estimated that the number of fall deaths among people 65 and older is 400% greater than fall deaths among people of all other age groups. This means that fall prevention is vital to the quality of life and health of people as we age, especially if you are over 65 years of age. Now that we understand more about increased risk factors associated with falling as you age, let’s move forward to prevention. Fall prevention and fall prevention strategy is the leading position you can take to avoid preventable injury and falling. If you have fallen, you know, from personal experience, what it is like to work your way through injuries suffered from a fall, along with many associated challenges including loss of self-esteem, loss of confidence when walking or climbing stars, and stepping over objects, and perhaps, to a large extent, fear and a level of avoidance associated with activities of daily living that you did not fear prior to falling. Fear is a powerful motivator. It can paralyze you in the sense that you may avoid doing things that can help you avoid or prevent another fall. There are many preventative measures and steps you can take to reduce your risk of falling. Related to environment, you home is where you presumably spend most of your time, therefor, you home should be made free of dangerous zones and walking pathways that are obstructed in any way. Cords from home phones, small appliances, such as fans, and space heaters, and lamps can contribute to trip and fall risks. Cords should always be safely positioned out of walkways and areas in which you normally pass or walk through. Along these lines, rugs, plants, shoes, and other items commonly found on floor surfaces should always be positioned in a secure manner, such as in the case wherein rugs are laid over rubber mats to keep them slip-free, and shoes, plants, bathroom scales, and other items commonly found on floor surfaces in your home are securely stored so that you do not trip over them. Away from floors to stairs, bathrooms, specifically related to wall safety attachments, if you do not have secure railings or handles you may grasp during climbing in and out of a tub, for example, or securely hold while climbing stairs, these wall mounted safety railings or handles can serve as prevention tools as well. In bathrooms and kitchens, wet areas pose a significant risk for slip-and-fall injuries. Be aware of your surroundings and collect information from as many sources as possible to help you maintain a home that is organized to present much lower risks for falling and slipping. Remember, the result of falling is often serious injury or worse. As I mentioned above, if you are over 65 your risk for death as a result of falling is 4 times that of the same mortality rates compared to people of other age groups. In fact, a comprehensive fall prevention strategy can save your life. All of these things mentioned above, and others, can contribute more to the challenge of falling than solutions. One of the most vital solutions for fall prevention is exercise. At any age, exercise is key for optimal health and fitness. Exercise strengthens all the systems of your body including your cardiovascular and circulatory systems, your bone and skeletal system, and, of course, your muscles. Exercise, along with healthy eating, improves bone mineral density, mental acuity, muscular strength and endurance, balance and coordination, and stability of major joints responsible for stabilizing movement, including walking, climbing stairs, and stepping over things. The guidelines for exercise most beneficial for fall prevention offered by the U.S. Health and Human Services Department suggest at least 90 minutes of moderately intense aerobic physical activities including full body, weight bearing exercise or activities like fast-paced walking, dancing, swimming, aqua-aerobics or other physical activities you might enjoy — as long as you stay within your recommended target heart rate and exclude activities that might interfere with medications, or preexisting bone or joint problems. Your doctor can best recommend activities that can be most beneficial for you. With the suggestion of your doctor, resistance exercise can help you to build and maintain muscle mass and bone density. Your goal should be to maintain a more ambitious goal of walking or exercising 5 hours a week, as you become more fit, you may simply adjust the intensity, duration, and frequency of your exercise as long s the benefits continue to outweigh any risks, as outlined by your doctor, associated with increased intensity in exercise. It would be a good idea to speak with an exercise professional about more detailed exercise recommendations that meet your specific limitations, concerns, and current physical fitness level. With the right frame of mind, a positive attitude, and help from people you know and trust, you can build a fall prevention program that will suit your needs and improve your quality of life — for the rest of your life. 1. “P.R.E.P. Education: Preventing Falls.” YouTube. Atlantic Coast Athletic Clubs, ACACFitness, 28 April. 2014. Web. 7 Oct. 2014. 2. “Falls and Older Adults.” NIH Senior Health. National Institute on Aging, 3 Oct. 20011. Web. 7 Oct. 2014. 3. “Falls.” National Safety Council. The National Safety Council, 16 Oct. 20011. Web. 7 Oct. 2014. Are you interested in preventing falls and exercise? Are you interested in learning about the benefits of exercise for fall prevention? Consider hiring a personal trainer. If so, please visit our homepage and use the “find an instructor by city” search bar. If you are a qualified personal trainer, exercise coach, pilates, yoga, or aerial fitness teacher, people are looking for your help. If you would like to share your website, and business details with our website visitors, please register your business by contacting Derek, on Instagram to share your business details, and location. Yes, it’s free – always. Please visit my LinkedIn page – let’s connect.